The GPAIR 2 is specially designed for track pilots. Emphasis was put on aerodynamics with a very slim cut and enough space for the racing combination allowing the freedom of movement. 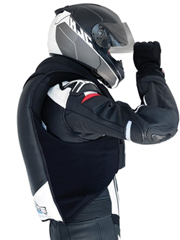 The width of the GPAIR 2 fits perfectly with your motorcycle suit thanks to its elastic fabric and the Velcro system. The red velcro shows the closing limit of the GPAIR 2. For more safety, the vest is made with abrasion-resistant materials and has protections at the front and back for a double Turtle effect. It is an excellent protection to vital areas. GPAIR 2 has a very tight cut due to its elastic side material. 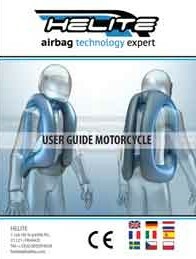 A stretchable fabric is used at the neck and shoulders and allows for optimal protection when the airbag inflates. The width of the GPAIR 2 fits perfectly with your motorcycle combination thanks to the elastic Velcro system. Measure from the floor to the top of your head. Measure horizontally around your abdominal, at its deepest body point with your motorcycle gear on. Cartridge 60cc 60cc 60cc 60cc The cartridge size must fit the airbag size.